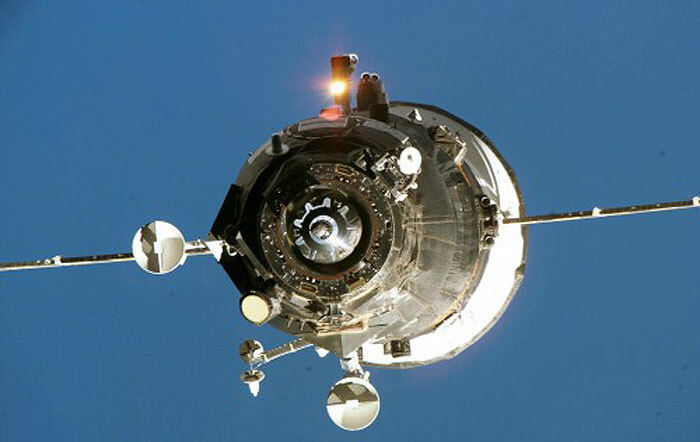 One of Russia’s unmanned Progress resupply spacecraft left the International Space Station (ISS) Saturday, Feb. 9, 2013. The departure was timed to make way for a new Progress, which is currently slated to arrive at the orbiting laboratory and workshop Monday. The Progress 48 cargo vessel was at the ISS for about half a year, and then it re-entered the Earth’s atmosphere, where it was incinerated. The entire process, from unlatching from the space station to the spacecraft’s demise, took about four hours total, with departure occurring at 8:15 a.m. EST and reentry occurring around noon. As with most things that occur on orbit, the loss of the Progress 48 spacecraft was used to benefit the Expedition 34 crew members on board. In this case, the spacecraft was packed with about 3,700 pounds of garbage. Even as Progress 48 was meeting its fiery end, the Progress 50 spacecraft was being readied for launch. The cargo vessel was rolled out to the Site 1 launch pad at Baikonur Cosmodrome in Kazakhstan. Progress 50 is currently slated to launch at 9:41 a.m. (8:41 p.m. Kazakhstan time) Monday. The Progress 50 will send some 764 pounds of fuel, 110 pounds of oxygen (including air to breathe), 926 pounds of water, and approximately 3,000 pounds of various equipment. All total, nearly 3 tons of cargo will be ferried to the space station. Progress 50 will dock at the same port that Progress 48 had been berthed to—the Pirs docking component of the ISS. The process by which Progress 50 will arrive at the station is accelerated compared to most of its predecessors (only two others before Progress 50 have used this method). The cargo ship will arrive at the station just six hours after it was launched. If anything should go wrong, controllers at the ground can switch back to the old, slower method, which would mean it would take two days before Progress 50 arrives at the ISS. Monday’s launch will be covered live. If all goes according to plan, docking should occur at 3:40 p.m. EST. The Russian Progress is one of four cargo vessels that deliver supplies to the station. The European Space Agency employs its Automated Transfer Vehicle, or “ATV,” the Japanese Aerospace Exploration Agency uses the HTV, and the U.S. has restarted sending supplies to the ISS via Space Exploration Technologies’ (SpaceX) Dragon spacecraft. Of all the cargo vessels that visit the ISS, only the Dragon does not burn up in the Earth’s atmosphere. The unpiloted ISS Progress 50 cargo craft docked to the International Space Station at 3:35 p.m. EST Monday, less than six hours after launching from the Baikonur Cosmodrome in Kazakhstan.